Now for the Beyond Part. I was invited by Stacy to attend. A Huge Thank You to her, everyone on the party bus and the band. It felt great to get out of the valley for a few hours. The main reason I wanted to cover the Battle of Bands? Curious how a local band would do in a completely different environment. Trick Stacy did not disappoint in the slightest!!!!! Before I let you know how the band did, a quick run down of the contest. Right off, this was the first time I attended a battle of the cover bands, usually, it is original music. The format was standard, each band having one set / quick changeover / as many people as possible showing up to support the bands. Basically, another popularity contest. Standard format, probably the worst. 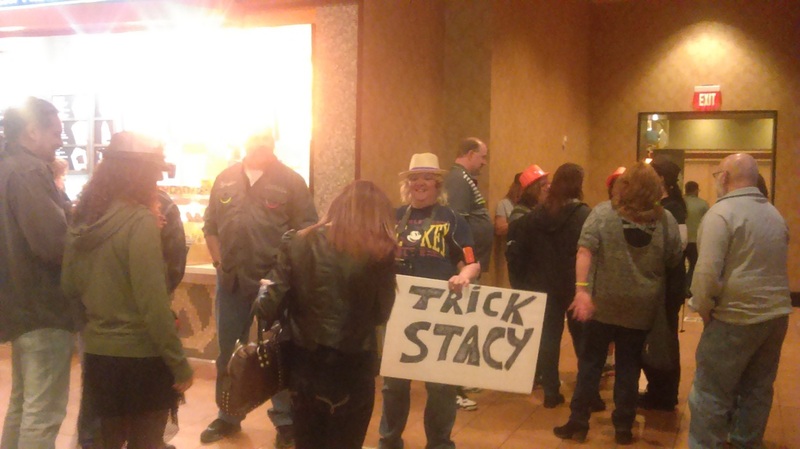 The fans of Trick Stacy did not disappoint in numbers / excitement / support! The one thing different about this contest? The judging was done by fans. Not different except the voting by text. Yes, everyone was told to text botb and the band you are voting for to a number. I really like this format. it used modern technology / fan participation without losing your hearing / each person could only vote one time. To a minor point, leveled the playing field. The setup of Breakers is one of the best I have seen! 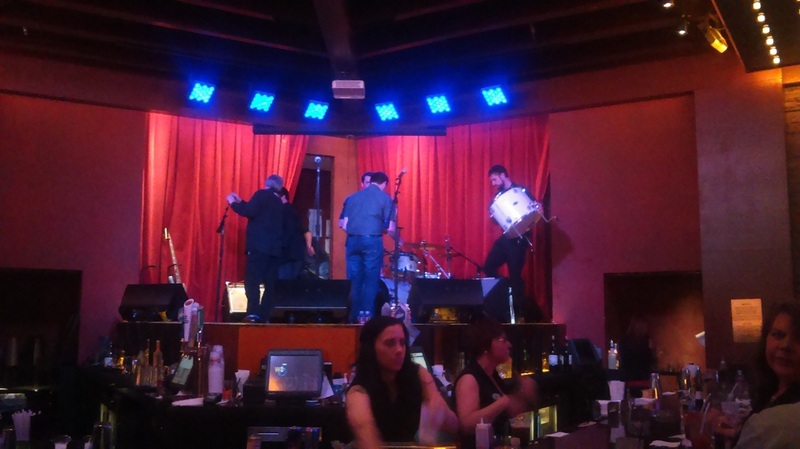 A raised stage behind the bar with 2 large screens so everyone can see the bands. There are 2, main, drawbacks; especially for bands like Trick Stacy. Lead singer, Stacy, loves to get out into the crowd and make everyone a part of the show (I have seen the band several times). The stage is fairly small which limits the amount a band can move around. The second challenge I was curious how Trick Stacy would adapt to. Time to find out if they were able to adapt to the new audience / stage setup. As you can probably tell from the videos, the entire band had no problem adapting to the stage setup. With very limited space to move, the band used it's natural energy and set list to really get the crowd involved. I was mainly watching reactions from people who were not there for Trick Stacy. Their overall reaction was excellent! Following the requested crowd participation and moving to the music. What really caught my attention was the amount of people who came up to band members after the show and gave sincere compliments. No, Trick Stacy did not win. The announcer did mention it was very, very close. Even though he did not say who the other band was that made it so close, everyone knew it was Trick Stacy. The band impressed a lot people at the Battle of the Bands. Have a lot of knew fans! This does work to their advantage with opening new venue possibilities beyond the Lehigh Valley. Overall, the band did a fantastic job adapting to the smaller stage and different crowd. Without being able to use one of their main advantages (making the crowd a part of the show by getting out into it), the band used their standard combination: high energy / music / set list to get everyone involved. Like I said, they have new fans and the possibility of new venues opening up from their performance. 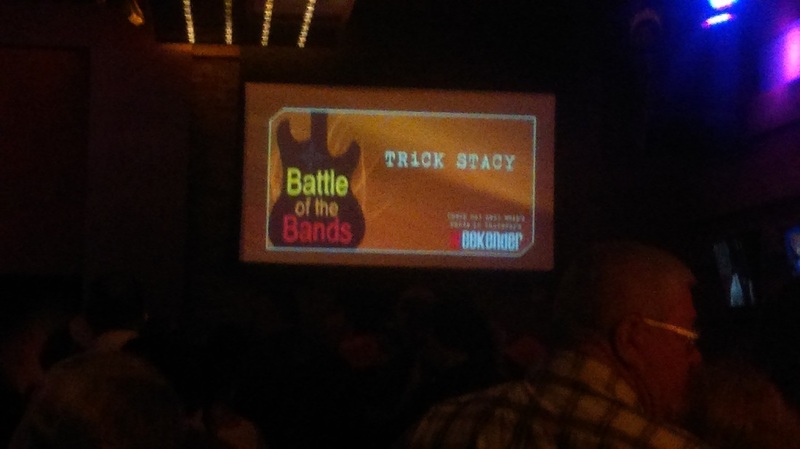 Trick Stacy proved, especially with the very close voting they are one of the TOP cover bands in the Lehigh Valley!